It’s clear that the Irish regulator is tightening controls of illegal behaviour of financial service providers in Ireland, following its €3.5m fine for Bank of Ireland (BOI) on Tuesday. The investigation into the bank’s controls found that it delayed in the reporting of six suspicious transactions to An Garda Síochána and Revenue. The Central Bank, the regulator who issued the fine, found “significant failures” in BOI’s anti-money laundering (AML) and counter terrorist financing controls, policies and procedures. Some of these included risk assessment, suspicious transaction reports, and correspondent banking. The breaches occurred in July 2010 and persisted on average for over three years. Fundamentally, this points to a lack of adequate controls within the bank. Something which was confirmed by a Bank of Ireland spokesman, who was quick to point out that this settlement was not as a result of actual money laundering or terrorist financing. What is interesting is that of the last four enforcement actions taken in Ireland, two of them were due to outsourcing of financial services to other institutions. In the instance of the Bank of Ireland, services were outsourced to a correspondent bank outside of Europe. 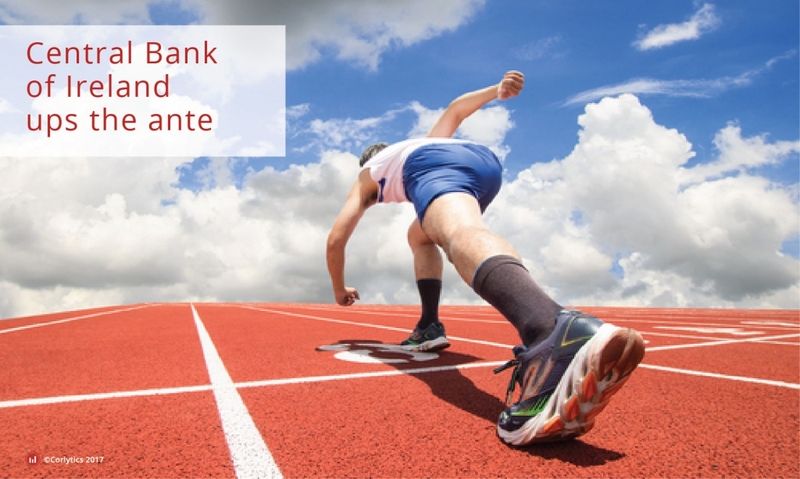 Correspondent banking is the process of using another bank (a correspondent bank) to transfer money to a jurisdiction in which the bank that originates the transaction does not operate. When dealing with correspondents, responsibility still lies with the bank itself to perform due diligence on the customers (both originator and beneficiary) of the transaction. This is where Bank of Ireland’s controls were seen to be weak. The last three fines of this type across Ulster Bank, AIB and now Bank of Ireland totalled €8.75m. 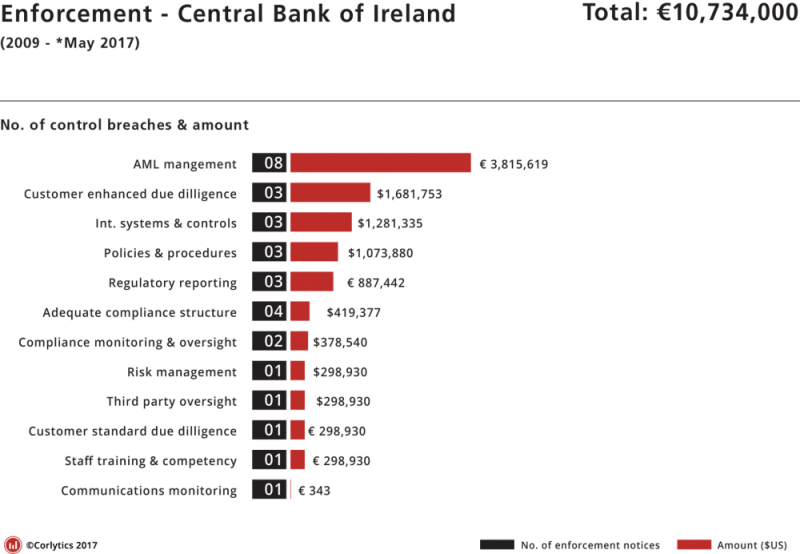 From examining the Corlytics database, we can see that the total amount of all fines from the Central Bank of Ireland from 2009 to May 2017 was €10,734,000. Clearly, this is indicative of a regulator sharpening its claws. The regulator has clearly stepped up its pace in the last six months. A second look at the data illustrates that the number of enforcements has in fact been increasing year on year since 2015. By taking a more analytical look at the Corlytics data, we can clearly see the control breaches that have lead to the BOI fines, which were in relation to AML management and enhanced due diligence, are top of the list when it comes to the enforcements that have been levied against organisations. In fact, €3.8 million of the €10.7 million in fines are made up of control failures for AML management. Clearly, this signals how important the regulator views compliance with the regulations and guidelines which are in place in Ireland. The Central Bank of Ireland is beginning to operate in the same way as other major international regulators and is well placed to tackle issues within the financial services industry in Ireland. Major financial institutions who are now considering setting up in Ireland as a result of Brexit will have to contend with a vigilant regulator who will penalise if necessary. The depth of information within the latest enforcement notice to Bank of Ireland is impressive. Demonstrating that this regulator must be taken seriously.